Published: Feb. 24, 2016 at 04:06 p.m. Updated: Feb. 24, 2016 at 08:10 p.m.
INDIANAPOLIS -- Arizona Cardinals general manager Steve Keim expressed wide-eyed wonder over David Johnson earlier this month, noting that it's "scary" to ponder how good the rookie sensation can be as he develops in his second and third seasons. Keim isn't alone in that sentiment. Around The NFL asked coach Bruce Arians at Wednesday's NFL Scouting Combine if Johnson is already one of the NFL's top running backs. "I can't say after one year's work that he is one of the best," Arians offered, "but he's got a chance to be one of the all-time best." Arians isn't anointing Johnson a Hall of Famer after 18 NFL games. He's simply pointing out that a well-rounded, three-down back who led the NFL in scrimmage yards from Week 13 through the end of the postseason has a chance to build on that elite production going forward. Per Next Gen Stats, Johnson recorded the fastest speed by a running back as a ball carrier in 2015. 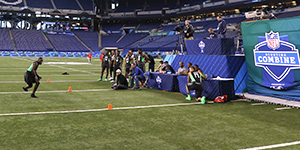 He also launched a 41.5-inch vertical leap at the NFL Scouting Combine last year. He's the rare back who combines freakish physical gifts with natural running and pass-catching ability. "Kind of like a Todd Gurley-style runner," Carson Palmer said of Johnson in early December. "Fast in the open field and just big, hard to bring down." That wasn't even the loftiest comparison inspired by Johnson. Venerable Cardinals offensive consultant Tom Moore has compared the former Northern Iowa star to Hall of Famer Franco Harris for his unique combination of size, speed, power and receiving ability. Arians might be reluctant to concede the self-evident in a public setting, but we're not: Johnson is already one of the NFL's premier running backs.